The weather has been so nice lately! I'm so glad we have the new floor in the sunroom, and the new French doors, and a lovely TV area (thanks Googer!). I have been spending most of my day in the sunroom, enjoying the breeze and all the outdoor smells that waft in - fresh cut grass, our petunias, our herbs. Mostly, I like settling back in 'my' chair (doesn't everyone have a favorite seat in their home, one that is 'theirs'?! ), propping my feet up on the ottoman, and reading. This past weekend I read The Jefferson Key by Steve Berry, which was quite good. A mish-mash of action & adventure, government intrigue, pirates and privateers, ciphers, conspiracy, presidential assassination, and documents written/hidden by the first presidents of our nation. Next to the sunroom is the deck, on which sits the grill, and who wants to be in the kitchen cooking when they could be outside grilling?! 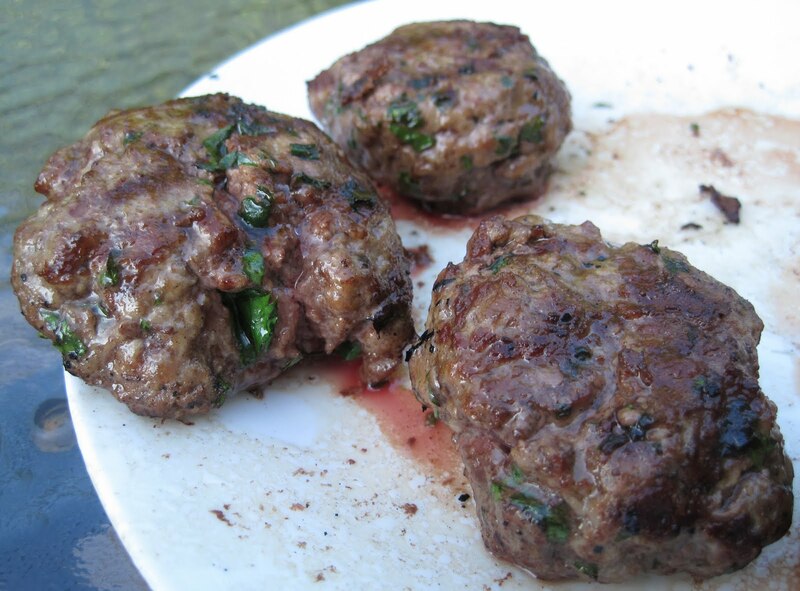 Our choice for this week's grilled meal: lamb burgers. 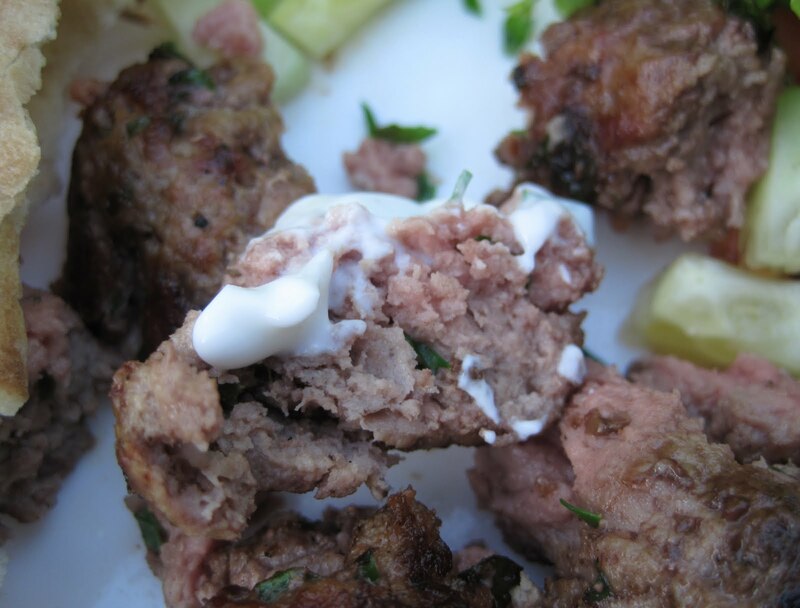 Specifically, Open-Face Lamb Burgers with Mint Yogurt Sauce from the July 2003 issue of Gourmet. We very loosely followed this recipe. 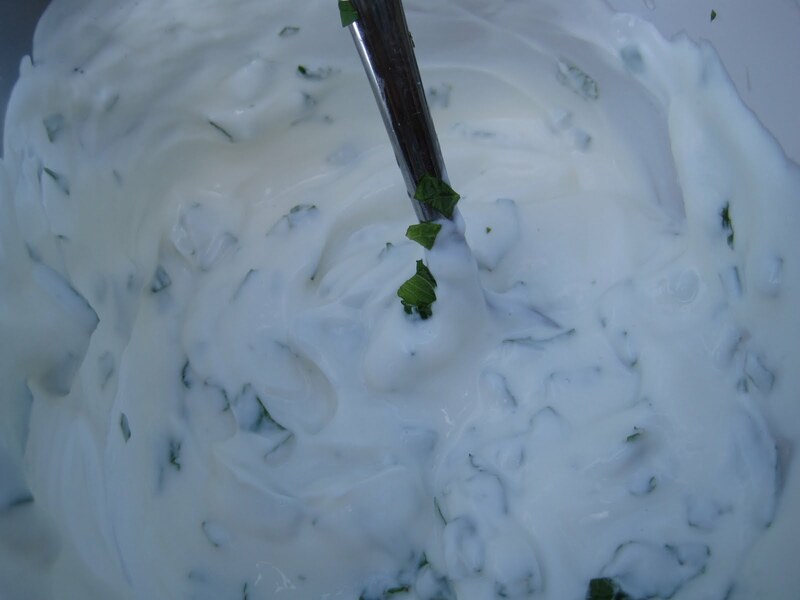 I made the yogurt sauce, minus the garlic, and probably with a bit more mint than called for. I'm so glad we are growing mint - there's something so refreshing about it. While I made the yogurt sauce, SP made the lamb patties. 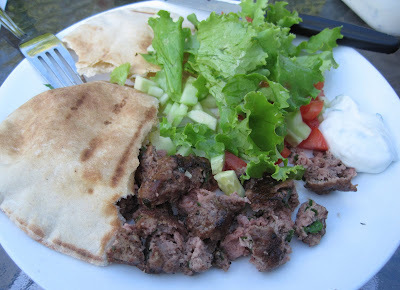 We added chopped chives (we didn't have any onions) & parsley from our herbs on the deck plus the allspice, salt, and pepper to the ground lamb. Then he headed outside to grill. 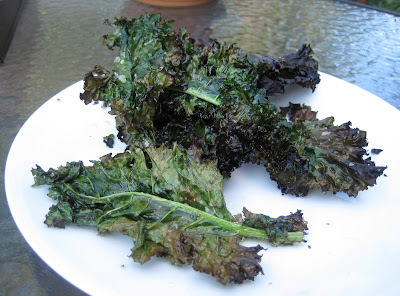 He started with trying again to grill some kale from our CSA, and this time had much more success: Coated with kosher salt and olive oil and this time, monitored very closely! I tried a few kale chips and they were pretty tasty, just crunchy messy as I got kale chip bits all over my plate & shirt! While he monitored his kale, I washed and chopped some lettuce from the CSA and tomato & cucumber from Soergel's: SP grilled a pita for me and a whole wheat tortilla for him: This was a pretty quick dinner to cook. We sat outside Monday evening, intending to enjoy a lovely evening. 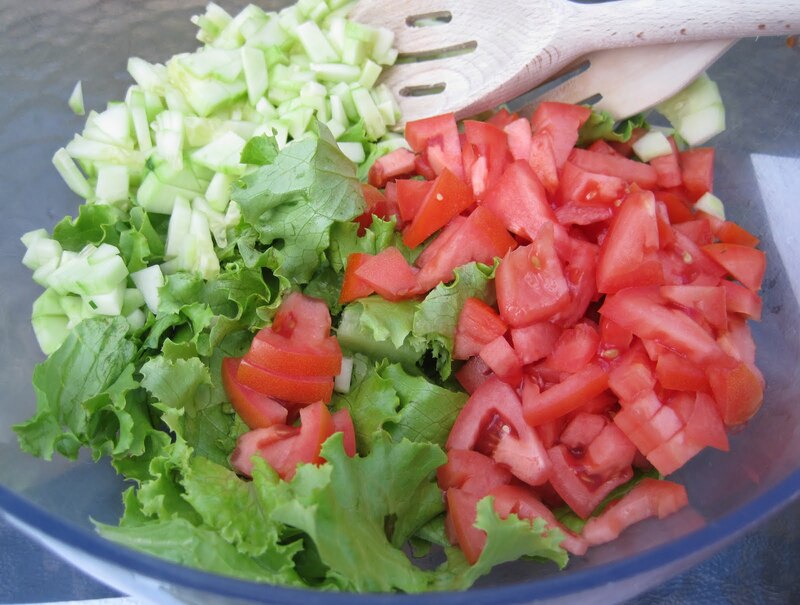 Unfortunately, since we eat late, it turned out that our dinner time is our neighbors' lawn care time so it wasn't too pleasant when everyone around us was mowing & weed whacking! Noisy! We couldn't hear each other talk! Also, it was pretty breezy, so it was chilly, and I actually got goose bumps! But we were all set up outside and we'd cleaned the deck table, so we went ahead and ate dinner outside. This is SP's plate: He crunched his tortilla into quarters and piled on his burger, sauce, and veggies. 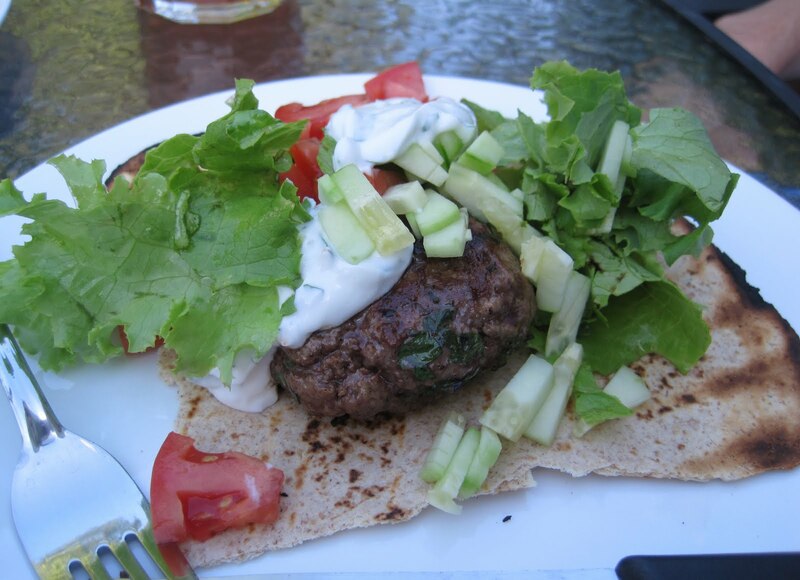 Here's my plate: I had four 'areas' on my plate: pita, burger, sauce, and veggie. I'd jab a bite of burger with my fork and then jab a piece of lettuce, tomato, and lettuce onto the fork, dip the pita in the sauce, and then take a bite of sauced pita followed by the forkful of jabbed food so that I had a mouthful of all the flavors. Yum! We really, really liked the yogurt sauce. The lamb burgers were wonderfully juicy but I think they could have used a bit more allspice or maybe next time use the onion instead of chives. It was a very tasty meal, one I'd make again, and really, there's no need for a recipe. I wanted to get the proportions of lemon juice/yogurt/and mint correct, but otherwise, any bread would work, and season the lamb any way you'd like, and use any toppings you'd like. But much like I find gyro sauce addicting and super yummy, this yogurt sauce was that yummy and addicting!